Weekly Winner: A Curry Like No Other — at least that I’ve had! I don’t pretend to be an expert on Indian food, just an ardent admirer. I find that I am drawn to any dish with the word “curry” in it … whether or not curry powder is actually used. I know so many people who claim not to like Indian food or curry because they “can’t stand the smell of curry powder”. What I’ve come to learn is that “curry” is basically a dish made with a complex combination of spices (which may or may not include said curry powder) but which almost always includes some sort of chile pepper. See? Cooking and eating can be educational too! So, regardless of your take on curry powder, if you like seriously spiced food (not spicy-hot) but a gradual, slow-building warmth as you eat, than do I have a dish for you. 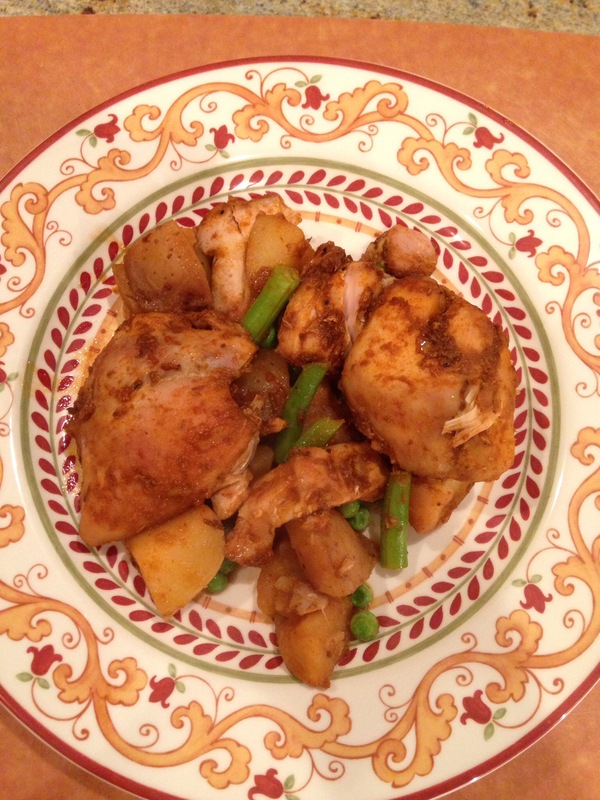 It’s Smoky Indonesian-Style Chicken Curry and I got this jewel from Fine Cooking Magazine. The magazine suggests serving it with rice; however since it has potatoes in it, I didn’t think that was necessary. It’s actually perfect just the way it is. The only change I made was to use boneless, skinless thighs since the recipe called for taking the skin off anyway. Put the chiles in a medium bowl and cover with boiling water; set aside to soften for 20 minutes. Drain, then transfer the chiles to a blender. Add the shallot, lemongrass, tomato paste, smoked paprika, ginger, brown sugar, sambal oelek, cumin, coriander, and 2 tsp salt. Blend the mixture until smooth, drizzling the broth through the hole in the lid and stopping occasionally to scrape down the inside of the jar. Generously season the chicken with salt and pepper and spread evenly with the chile mixture. Layer the potatoes in the bottom of a 5- to 6- quart slow cooker and arrange the chicken in an even layer on top. Cover and cook until the potatoes are fork-tender and the chicken is tender but not falling off the bone, 2 to 3 hours on high and 6 hours on low. About 30 minutes before serving, turn the slow cooker to low and sprinkle the green beans evenly over the top, cover and cook until crisp-tender. Add the peas and cook until heated through, about 10 minutes. Stir to combine, season to taste with salt and pepper and serve. I am not really a dessert person. I prefer to use vital stomach space for savory food. Not to say I’d turn down a piece of chocolate or a bowl of good ice cream, but on the whole I am all about the main course. At the same time, I’ve always been drawn to any kind of pot pie, dumpling or biscuit dish — if it has some kind of bready, crumbly, pastry-type topping, I’m generally a fan — as long as what’s underneath is savory. So imagine my delight when I found this recipe for Italian Sausage and Broccoli Rabe Cobbler in Cuisine at Home Magazine. Now this is a cobbler that speaks my language! Forget some wimpy berries or fussy stone fruit — we’re talking pork!! 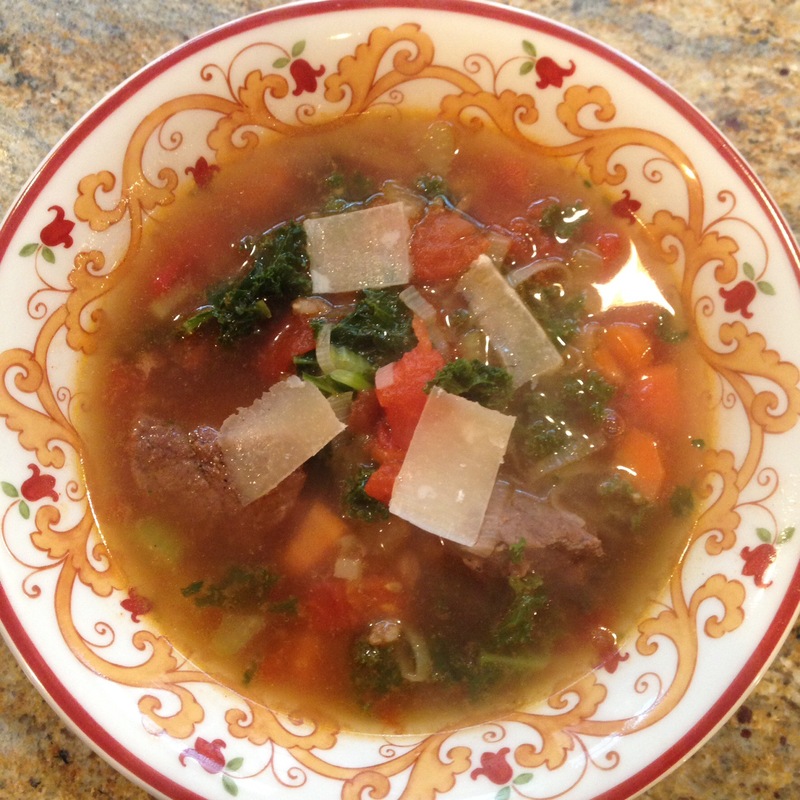 I made it for our Sunday Supper and it was a total hit. It’s basically a one-pot wonder and makes an incredible homey, cosy meal that’s even company-worthy. 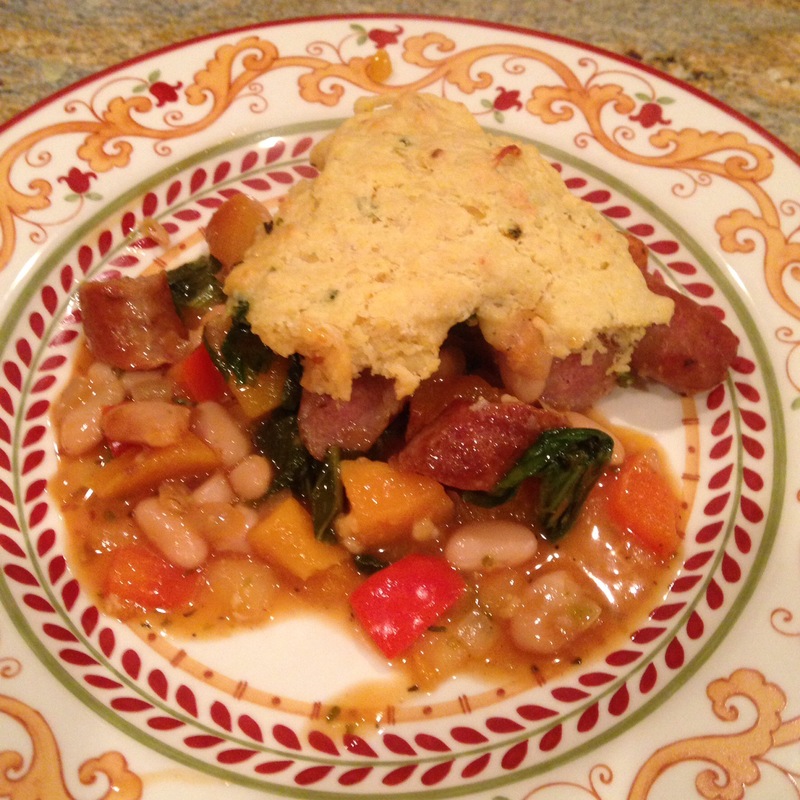 The dish is a great combination of sausage, beans, butternut squash and broccoli rabe all tucked up under a wonderful buttermilk-parmesan biscuit. The recipe calls it “dumplings”, but it is actually more of a biscuit which is where I’m sure they got the whole “cobbler” theme. Whatever you call it, it will be happening here for dinner …. frequently. Preheat oven to 400F with rack in center position. For the filling – heat oil in a large cast-iron skillet over medium-high. Add sausage and cook, covered, 5 minutes per side; transfer to a plate. When cool, slice sausage on the bias into 1 inch pieces. Add onions, squash, and bell peppers to skillet; cook 5 minutes. Stir in garlic and tomato paste; cook 1 minute. Deglaze pan with wine, scraping up any brown bits, and reduce until nearly evaporated. Stir in beans, Italian seasoning, and sausage; season with salt, black pepper, and pepper flakes. Whisk together broth and cornstarch and add to skillet; reduce heat to medium-low and cook until thickened, 5 minutes. Sir in broccoli rabe. For the dumplings, combine flour, cornmeal, parmesan, sage, baking powder, baking soda, and salt in a bowl. Whisk together buttermilk, butter and egg; stir into the flour mixture just until combined. Spoon dumplings over filling in the skillet and bake until a toothpick inserted into the center of dumplings comes out clean, 30 minutes. Remove cobbler from oven; let rest 10-15 minutes before serving.